Since I chose a nature/wildlife theme for my Tarot deck, it only seemed appropriate to have death represented by something human. I'm not a proponent of the philosophy "Mankind is only capable of evil," but I do agree that more often than not our opposable thumbs are used to create more harm than good. Thus, I thought nature might enjoy some symbolic payback! I wanted a winged harbinger of death, and I thought that a raven, with its myriad shades of black feathers, would be perfect. Ravens are beautiful birds, save for their voices, and even their chatter is not without pleasantness. 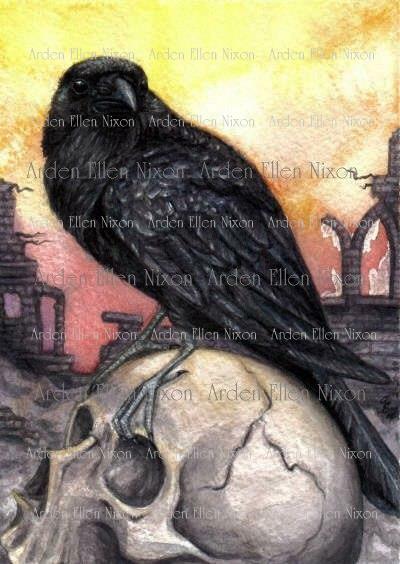 No one is immune to their attentions, anymore than even the raven, itself, is exempt from dying. We are all a part of the same cycle. (Cue the opening chords of "Circle of Life").